It has been many years since the hardback edition of the Holoviak King James Version Gospel was available for sale, apart from being purchased along with a somewhat expense metal cover. A few years there was a Byzantine Lectionary based on the KJV available in hardback, but now that edition is only available in a softcover. Now, at long last, Reader Peter Gardner has come to the rescue. This edition is available in two sizes: a smaller edition for $40.00 (6"x 9", with 12-point font); and a larger edition for $45.00 (8.25"x 10.75", with 14-point font), and it actually has several elements that are not in the older Holoviak edition. 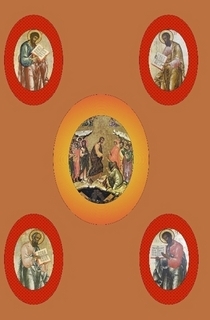 Based on the contents of the standard Slavonic Gospel, it contains a brief life of the four Evangelists, an extensive appendix of the Gospel readings (more extensive than is found in the Holoviak version), and the rubrics for how the Gospel readings are done throughout the year, including the "Lukan Jump." The cover is as seen in the photo above (this is the actual hardcover, not a dust jacket). For a small mission or home, it is usable as it is. The text is in standard sizes, and so could also be put into a nicer Gospel cover. There are a few things that would improve future editions of the text. The King James text of the Gospels is remarkably easy to read, even after 400 years of changes to the English language, and so there are not a lot of obscure archaisms that are a factor, but because the King James text was done by different teams, there are some inconsistencies in the original King James, and one of them is that in the Old Testaments, the names of people and places were based on transliterations of the Hebrew (e.g., "Elijah," "Elisha," "Jeremiah"), whereas in the New Testament, the names of those same Old Testament figures are found in forms based on the Greek text, or older English usage ("Elias," "Eliseus," "Jeremy"). Also, even within the Gospels there was some inconsistency in the use of "Holy Ghost" and "Holy Spirit." The Holoviak Gospel made the decision to use the most standard form of the names of Old Testament figures in its Gospel. It also generally replaced "Holy Ghost" with "Holy Spirit", though there are some places in which it failed to do that consistently. In my opinion, these were both good decisions. In the case of the names of Old Testament figures, to the extent that Biblical literate people know anything about these figures when they are mentioned in the Gospels, they know them by the more standard form of their names in the Old Testament, where their stories are found. While "Holy Ghost" was once commonly used in English, that usage has become increasingly rare, and I think we might as well have some consistency with the form we normally use in our private prayers, and in our public services. One other thing that would improve the text would be to use red ink for the rubrics. This would of course make the text more expensive, but perhaps, since the text is a print on demand edition, a more expensive edition could be made available as an option. Reader Peter Gardner also has plans to publish an Apostol that will likewise be based on the King James Version. In the case of the Apostol, my recommendation would be to do a little more revision of the King James text to eliminate some of the more obscure passages, because unlike the text of the Gospels, some of these readings can be very difficult for the average English speaker to understand. This text fills an important need for English speakers, in many respects it is the first full edition of the Slavonic Gospel in English, it is sturdily bound, and very affordable. I highly recommend it. Update: There is now edition of this Gospel that is in full color, for $125.00. Question: "I have heard some claim that Orthodoxy does not approve of self defense or firearms specifically, specifically attacking the "take your purse and buy" a sword verse from Luke that is often used in support of armed Christian self defense. He even went so far as to say, or at least strongly imply, that Christians shouldn't kill in combat/war. So, I suppose the question is, what is the Orthodox Church's teaching regarding a Christian's right or ability to hurt or kill others in self-defense? As soldiers during war? What about defending one's family from violence?" 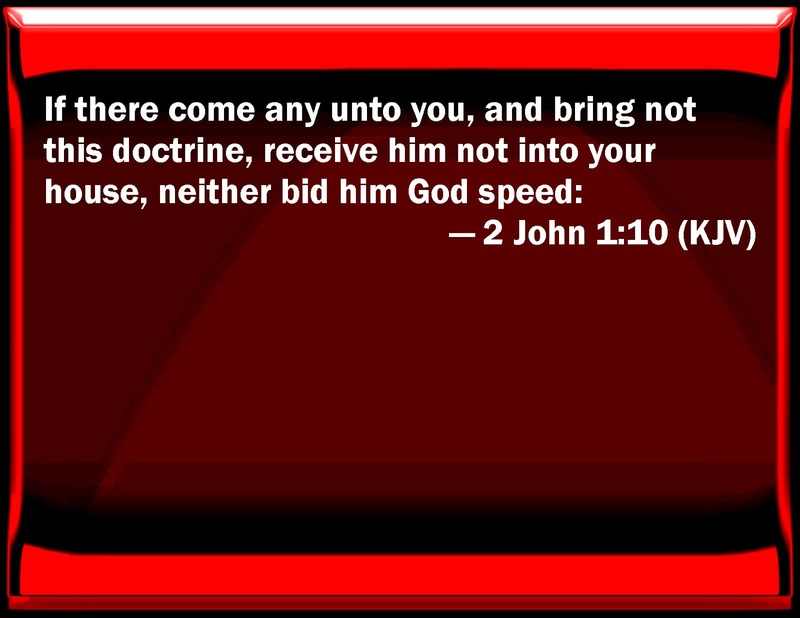 "And he said unto them, When I sent you without purse, and scrip, and shoes, lacked ye any thing? And they said, Nothing. Then said he unto them, But now, he that hath a purse, let him take it, and likewise his scrip: and he that hath no sword, let him sell his garment, and buy one. For I say unto you, that this that is written must yet be accomplished in me, And he was reckoned among the transgressors: for the things concerning me have an end. And they said, Lord, behold, here are two swords. And he said unto them, It is enough." 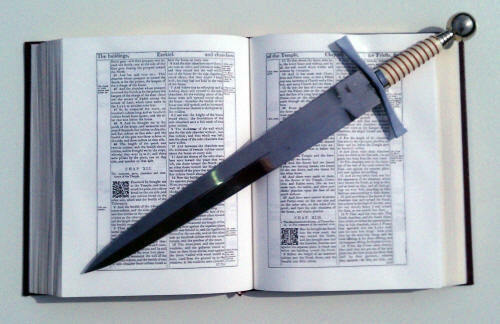 "Put up again thy sword into his place: for all they that take the sword shall perish with the sword" (Matthew 26:52). "Thinkest thou that I cannot now pray to my Father, and he shall presently give me more than twelve legions of angels? But how then shall the scriptures be fulfilled, that thus it must be? " (Matthew 26:53-54). "The directive to buy a sword deserves a measure of separate consideration. Lined up as it is with purse, bag, and sandals, we can eliminate at once any idea that zealot sympathies are coming to expression with the commendation of the sword. The sword is thought of as part of the equipment required for the self-sufficiency of any traveller in the Roman world. Nothing more than protection of one's person is in view." (John Nolland, Word Biblical Commentary, vol. 35C: Luke 18:35-24:53 (Nashville: Thomas Nelson, 1993), p. 1076). It should also be noted that the word for "sword" here (machaira (μάχαιρα)) can refer to anything from a knife to a short sword (See Theological Dictionary of the New Testament, Volume 4, ed. Gerhard Kittel (Grand Rapids, MI: Eerdmans Publishing, 1964-1976), p. 524ff). There are two related but distinct questions here: 1). What does Scripture say about the private ownership of weapons? 2). What does Scripture say about using force, either in self defense, in defense of others, or as part of the military or police force? As for the first question, there is nothing in Scripture that prohibits the private ownership of weapons. The passage in Luke 22 does not require us to own them, but it does not forbid them either. In the Code of St. Justinian, there were restrictions on the private ownership of military grade weapons and armor, but even this did not prohibit the ownership of weapons such as staves, or knives (see Novel 85). It is true that this law was authored by a saint of the Church, but it reflected what was in the interest of the Roman state, which was to make revolts in a vast and diverse empire less likely. Rome also had a large standing army. On the other hand, in English history, the Kings of England long encouraged the practice of archery by the common people, because they did not have a large standing army, and in times of war, the skill of the average English bowman was in the interest of the state, and this necessarily required the common ownership of a very lethal weapon. "Ye have heard that it hath been said, An eye for an eye, and a tooth for a tooth: But I say unto you, That ye resist not evil: but whosoever shall smite thee on thy right cheek, turn to him the other also" (Matthew 5:38-39). The question we must ask about this passage is does the Old Testament law regarding an eye for an eye relate to personal revenge, or defending ones family, faith, or homeland from attack? It in fact pertains to personal revenge. This law was actually an improvement on the usual practice of exacting many times more punishment than the original offense had inflicted on the person offended. Christ raised the bar to the next level, and said that we should not seek personal revenge at all. However, we cannot and should not turn the other cheek when the defenseless are being attacked, because it isn't our cheek to turn. "Defend the poor and fatherless: do justice to the afflicted and needy. Deliver the poor and needy: rid them out of the hand of the wicked." (Psalm 81:3-4). The problem is that, usually, oppressors don't stop oppressing the weak simply because we ask them nicely to do so. More often than not, force, or at least the threat of force is necessary. So do these scriptures contradict the commands of Christ? No, they refer to defending others, not to seeking revenge. A scourge is not something used to gently influence someone -- it is something used to violently beat other people, so as to inflict pain, in order to violently coerce them in some way or other. Whether He actually struck anyone, or merely threatened to, we are not told, but we do know that the money changers at least believed he would have, and left expeditiously. Saints Boris and Gleb are often cited by Orthodox pacifists as examples of the way Christians ought to respond to war. After their father, St. Vladimir, reposed, their brother sought to usurp the kingdom, and so plotted to kill them. They offered no resistance, because they did not wish to fight their brother, nor to see a bloody civil war. However, they were not facing an external enemy who was seeking the destruction or subjugation of their people, but their own brother, and so they chose the path of martyrdom. Their act of personal sacrifice was praiseworthy. St. Alexander Nevsky faced a completely different situation, and Ss. Boris and Gleb actually played a role in his course of action. St. Alexander Nevsky faced an invasion from the heterodox Swedes, and so had to defend his people and his Faith. Had St. Alexander Nevsky decided to not resist the Swedes, it would not have been a praiseworthy act, but rather a dereliction of duty. It would not have been a higher path, it would have been a sinful path. So in the lives of these saints we see the balance between turning the other cheek, and defending one's own. St. Alexander's actions were praiseworthy, and Ss. Boris and Gleb's were praiseworthy... and there is no contradiction between them because they all responded to different situations in complete accordance with the commands of Christ. What is true of the defense of a nation on a big scale would also be true of the defense of one's family on a smaller scale. As for self defense in a situation in which one is in danger themselves, but in which no one else is in danger, I do not believe that Scripture forbids the use of necessary force to defend yourself from a serious assault (as opposed to a personal quarrel in which there was no real danger), but it is certainly true that it is praiseworthy to not defend yourself. It is less complicated if you do not have a family that is depending on you, and more complicated if you do. All life is sacred, and we should never take the shedding of blood, lightly, however, a husband and a father has to take care of his family. As St. Paul admonished: "But if any provide not for his own, and specially for those of his own house, he hath denied the faith, and is worse than an infidel" (1 Timothy 5:8). And this does not just mean that he needs to bring home a pay check, it also means that he needs to take care of them, and that includes their protection, and it also entails that he try to the best of his ability to continue to be able to provide for his family. With regard specifically to the question of the private ownership of guns. There obviously is no Orthodox position, one way or the other. It is a question of wisdom, and reasonable people can disagree. I think we would all agree that if banning private gun ownership would eliminate gun crime, and if we never had cause to fear our own government, that this would be wonderful. However, it is not quite that simple, in my opinion. I know that people in the United Kingdom and Australia generally think Americans are crazy for wanting to have private gun ownership, but I would point out to them that in both cases, they live in Island nations that do not have a 2,000 mile border with Mexico. We have been unable to stop a steady flow of drugs across that border, and we even have a huge human trafficking problem. If we had a gun ban in the United States, there would be no stopping a steady flow of illegal weapons into the hands of criminals. So we simply have a different set of circumstances. An Orthodox Christian is free to be opposed to the private gun owndership, but it is not true that the Tradition of the Church requires anyone else to agree with them, nor does it prohibit the use of force in defense of one's country, family, or even one's person, depending on the circumstances. Question: "What does the Church teach about having non-believers in our homes and parish Temples? 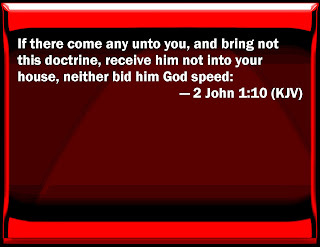 2 John 1:10, seems to suggest that we should not have anyone who professes a teaching contrary to the Trinitarian faith into our homes, or to even greet such a person. Was this message specifically for one person or one type of person? Does this chapter have anything to do with the historical practice of keeping the Creed a secret or in asking Catechumens to leave before the Creed is recited in the Liturgy? How should orthodox believers apply this teaching to our own lives?" "Now we command you, brethren, in the name of our Lord Jesus Christ, that ye withdraw yourselves from every brother that walketh disorderly, and not after the tradition which he received of us" (2 Thessalonians 3:6). "...but if he neglect to hear the church, let him be unto thee as an heathen man and a publican" (Matthew 18:17). "But now I have written to you not to keep company with anyone named a brother, who is sexually immoral, or covetous, or an idolater, or a reviler, or a drunkard, or an extortioner—not even to eat with such a person." All of these passages speak of people who are in serious error, either doctrinally, or morally, and clearly, these passages teach that there are some circumstances in which we should have no fellowship with such people... but the question is, what kind of people are were talking about, and under what circumstances would this apply? "I wrote to you in my epistle not to keep company with sexually immoral people. Yet I certainly did not mean with the sexually immoral people of this world, or with the covetous, or extortioners, or idolaters, since then you would need to go out of the world" (1 Corinthians 5:1-10). "Paul does not forbid the Corinthians from eating with unbelievers, since he says: If an unbeliever invites you to dinner and you want to go, eat whatever is put before you" [1 Corinthians 10:27] (Ancient Christian Texts: Commentaries on Romans and 1-2 Corinthians, Ambrosiaster, translated and edited by Gerald L. Bray (Downers Grove, IL: Intervasity Press, 2009) p. 143). 2) It arguably does not apply to those who, though once part of the Church, have fallen into sin, and who no longer make a pretense of being among the faithful. I say this based on the example of the Lord, who regularly ate with known sinners. In such cases, he was not pretending that these people were not guilty of any sin, and were already in a right relationship with God, but was reaching out to those long estranged from the faithful of Israel. But beyond this, we have to ask how these passages might apply to heterodox Christians. On the one hand, if we treated them as if they had been Orthodox, and then departed into heresy, schism, or gross immorality, then these passages would also apply directly to them. On the other hand, some might argue that they would fall under the class of unbelievers. But there are problems with both positions. Obviously, it is not the case that they were ever Orthodox, and so they would not have the same level of responsibility as would an Orthodox Christian who departed into heresy. But we also cannot say that there is no difference between such people and pagans. "In the end, I think, Father Dimitry Dudko’s attitude is the correct one: We should view the non-Orthodox as people to whom Orthodoxy has not yet been revealed, as people who are potentially Orthodox (if only we ourselves would give them a better example!). There is no reason why we cannot call them Christians and be on good terms with them, recognize that we have at least our faith in Christ in common, and live in peace especially with our own families. St. Innocent’s attitude to the Roman Catholics in California is a good example for us. A harsh, polemical attitude is called for only when the non-Orthodox are trying to take away our flocks or change our teachings" (Quoted in Not of This World: The Life and Teaching of Fr. Seraphim Rose, pp. 757-758). I would say much the same with regard to those who were baptized Orthodox as infants, but who have never really been Churched. Such people, unfortunately, are no more knowledgeable about the faith than any other unbeliever, and so we should want to open doors for such people, rather than close them. So who would we applies these verses to? These verses would certainly apply to heretics and schismatics who were Orthodox, but who have been formally cut off from the Church. They could also apply to those who are under excommunication for a serious sin... but that depends. There are many people who fall into a serious sin, and for some period of time their parish priest places them under a penance that includes being prohibited from receiving communion, but in those cases in which the person recognizes their sin, and is submitting to the penance, there would be no need to bar them from other forms of fellowship. It would apply to those who are prohibited from communion because of a serious sin that they refuse to repent of, and who, by their open defiance of the standards of the Church, cause scandal and disruption in the Church. This, however, is a situation that I think is fairly rare. I certainly have never had to deal with such a situation. It is a little less clear how to handle those who are prohibited from communion because of a serious sin that they are not yet prepared to repent of, but who continue to attend the services, and do so in a way that is not disruptive. In the first several centuries of Church history, when there was very strict discipline maintained with regard to who could be in Church, such people would be excluded from attending the services, and quite possibly from fellowship in the homes of believers. However, that kind of discipline ceased to be the common practice of the Church for well over a thousand years. Under today's circumstances, I do not believe that level of strictness would be in order, for such a person. It is better for them to keep coming to Church, and we would hope that they come to repentance at some point, so they could be readmitted to communion. And it would be better for them to maintain relationships with people in the Church, so long as there was no winking at their sin, or danger of others falling into their sin with them. Of course, if one had any questions about what to do, they would need to seek the guidance of their parish priest or local bishop, who are the ones ultimately responsible for imposing discipline in the Church. The purpose of all of these verses is the salvation of the sinner or the heretic, and the edification of the Church. It is not to adhere to the letter of the law, or to punish for punishments sake. It is said of the Old Testament Prophets that they afflicted the comfortable, and comforted the afflicted -- and that saying, while pithy, actually has a great deal of merit to it. If you have someone who is a heretic or schismatic, seeking to divide the Church, or a careless sinner whose behavior is causing scandal to the Church, such a person would be in need of some measure of affliction, to wake them up. There would also be need for the shepherds of the Church to protect the rest of the flock. On the other hand, when you have sinners who are struggling with their sins, we should follow the example of Christ, and reach out to them with love. And when dealing with the heterodox, we have to keep in mind that with knowledge comes responsibility, and we cannot hold them to the same standards as someone who was raised in the Church and should know better. If they are not actively seeking to proselytize or divide the Church, we should nurture such relationships, because that is how many are ultimately converted. *"Ambrosiaster" is the name given to the author of commentaries long attributed to St. Ambrose of Milan, but which most scholars believe to have been written by a later author.